Crap. I was really looking forward to getting my Apple TV ($299) this month. I guess I’ll have to wait a little bit longer. This morning I got the following email from the Apple Online Store regarding my Apple TV pre-order. Apparently “wrapping up” took ” a few weeks longer” than they expected… whatever that means. Thank you for ordering the new Apple TV, an easy to use and fun way to wirelessly play all your favorite iTunes content from your Mac or PC on your widescreen TV. Wrapping up Apple TV is taking a few weeks longer than we projected, and we now expect to begin shipments in mid-March, not in February as originally anticipated. You may check the status of your order any time by visiting our online order status website at http://www.apple.com/orderstatus. A shipment notification, with tracking information, will be emailed to you as soon as your order is shipped. There is no need to contact us unless you choose to change or cancel your order. We appreciate your business and thank you for shopping at the Apple Store! When I do get my Apple TV (hopefully next month? ), it should be an easy setup. Apple is promising true plug-and-play installation. 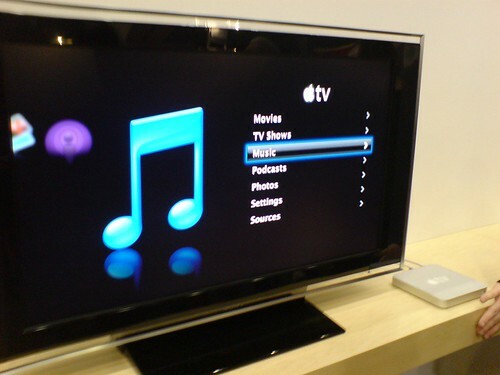 Just connect Apple TV to your TV (even HDMI is built in) and start iTunes, which will automatically detect it. A few clicks on my remote and I should be in business.